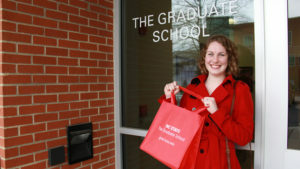 The Graduate School has a new way to recognize students who complete their doctorates – a customizable t-shirt with a space where students can state their area of expertise and proclaim their degree completion. The shirts were designed by recent College of Textiles graduate Kelsey Boes, who earned a Ph.D. in fiber and polymer science. Boes’ design was selected as the winner of a contest sponsored by the Graduate School. When Ph.D. or Ed.D. candidates fill out their request for final exam form, they can indicate their t-shirt size. The shirts will be sent to their committees to be presented once they have passed their defense unconditionally. In late summer, students began requesting the shirts, as word spread about the project. This was the first shirt design competition Boes had ever entered, though she’s designed t-shirts before. Her interests, going back to her undergraduate studies at Wheaton University in Chicago, span both arts and sciences. She earned bachelor’s degrees in chemistry and studio art. For a senior project, she created whimsical icons of elements in the periodic table. She later turned the designs into posters and t-shirts that were sold on the arts vendor site Etsy. She also designed some quilts and fabrics that she sold online. “I think it’s a fun way to wear your success,” she said of the defenders t-shirts. And photos of new Ph.D.s and Ed.D.s wearing their shirts on social media platforms will give people a better idea of the diversity of those who earn advanced degrees. “People tend to think that Ph.D.s are older,” Boes said, pointing out that many doctoral degree earners are still in their 20s or 30s. Boes has a long-standing interest in science communication. 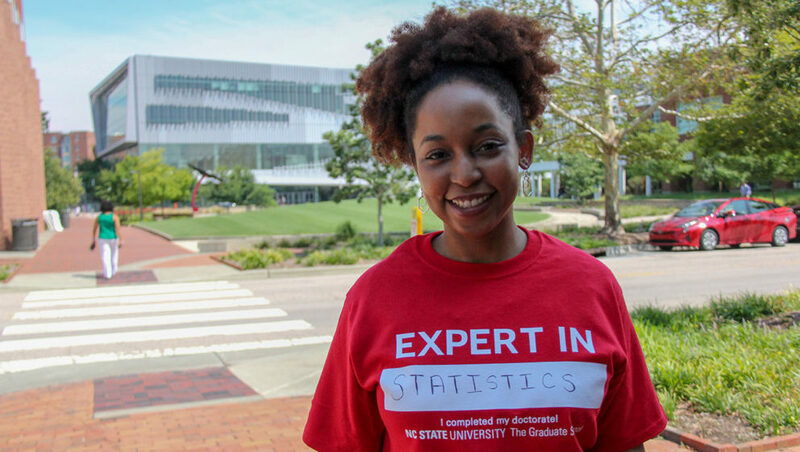 In 2017, she was one of the organizers of Triangle ConSciCom, a two-day science communication workshop held annually in the Triangle area. She says her long-term goal is to be a science communication professional for industry. Five graduate student teams won cash prizes in NC State’s 10th Annual Lulu eGames competition held April 3. The eGames provide more than $100,000 in venture capital to entrepreneurial campus teams. Faculty members Emily Berglund and Tammy Gordon have been named 2018 Outstanding Graduate Faculty Mentors by the Graduate School.